Hebro Pop-Up Party: Pride Edition - Join Hebro's for a pop dance party celebrating Pride with your favorite Jew-tunes and hosts Landy SinaGaGam Adam Werner & Jon Landau! For the first-time ever, Space Ibiza NY gets a gay party. This newly opened 5,000 square foot space opens just in time for Pride and Hebro has its first gay party there. 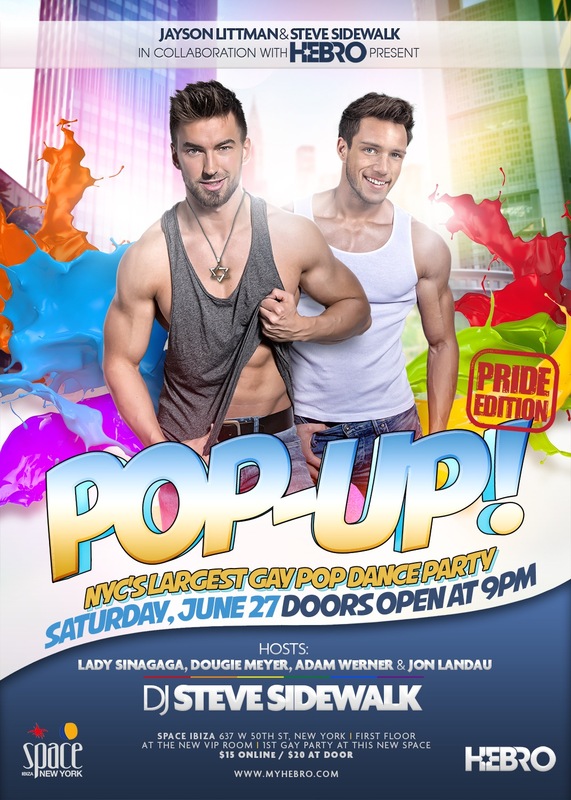 Join over 500 gay Jews and we dance the night away to music, including Israeli-pop tunes and the top-40 pop and dance remixes. DJ Steve Sidewalk DJ's this party. You won't wanna miss this Hebro party! Start out your Pride weekend with Hebro's Pride event at The Jewish Museum. Join over 200 gay Jews at this social takeover of one of NYC's most fabulous modern-art museums. This is a beautiful event space exclusively to Hebro! A 4-hour open-bar is included in your entry. Event Type: Social, Art, Open Bar, Gay Jews.